The North Coast 500 (Scotland’s answer to route 66) is a 516-mile scenic route around the north coast of Scotland, starting and ending in Inverness. The newly established route winds its way around the most northerly area of Scotland. The route can be covered either clockwise or anti clockwise (we prefer clockwise). The route starts in the northern city of Inverness, then heads west through the villages of this area via Achnasheen and Loch Carron and weaves along the west coast to Applecross and then northwards towards Torridon, Gairloch and Ullapool. 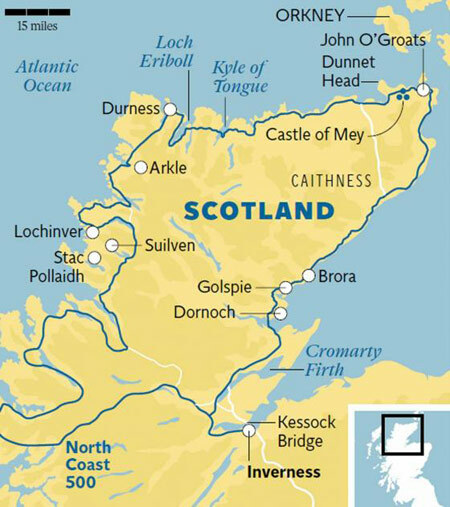 From there, you’ll venture to some of the most northerly coastal points in Scotland, passing by Achmelvich , Kylesku Bridge and onto Durness, Caithness and John o’ Groats before heading south again through Sutherlands coastal villages , towards Tain, Dingwall and finally back to Inverness. Everything that you need to know about the route is available on the official NC500 Website https://www.northcoast500.com. It shows full details of the route, links to accommodation, attractions, restaurants, hotels, guest houses, campsites and points of interest. To fully experience the route, you should allow a minimum of 5 days, which allows you to make the most of what Scotland has to offer in terms of Visitor attractions, food, scenery, traditional music and accommodation. You can of course just follow the wide open spaces and enjoy riding the bike over one of the best routes in the world. If you fancy having a team of experts doing all the hard work so you (and your friends) can just turn up and submerge yourself in the outstanding roads, scenery and biking roads then take a look at Haggis Tours Ltd Website https://www.haggistours.co.uk and let them organise a world class tour that you will remember forever more.